Sea World decided not to kill the killer whale that killed its trainer the other day in Orlando. I wonder how this whale species got its name? Anyway, very tragic. I feel bad for that lady. She definitely loved that animal. And I was there just a few months ago, so this hits home a little more than normal. The Orca show went on today after a short suspension. So what should Sea World do now? Obviously they need to implement the strictest safety rules and review those plans regularly. But... what they really should do is work on their Public Relations plan for the next time someone is killed by a Killer Whale. Because these are wild animals and I guarantee there WILL be a next time. Just like the Indy Car Racers know there will be another fatal crash despite all the safety precautions. Just like I know that there will be catastrophic hurricanes in Florida. Inevitable. Sorry to bring you a dose of reality! 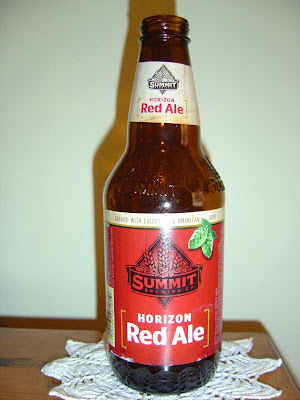 Tonight I'm drinking Horizon Red Ale brewed by Summit Brewing Company in St. Paul, Minnesota. This is my second beer from this brewery after drinking their Extra Pale Ale a few days ago. The label says this beer was "brewed with exceptional American hops". I should hope so! Grainy citrus aroma with some caramel. Lots of grain flavors with some lemony citrus to start. A little grassy with a dirty texture. A hint of nuts comes through. There is a really good amount of hops helping show off a refreshing light bitterness. Medium carbonation is a little prickly. You finish with a dry, metallic, slightly off-flavor, band-aid taste in your mouth. Except for that, this beer reminded me of... hold on to your seat... their Extra Pale Ale I had two days ago. An OK beer. Crap! No Picture tonight. Don't worry. I'll fish the bottle out of the recycling bin tomorrow! Next day update. Here you go needy people. I had some of this last night at the festival. Not bad in my opinion. A solid session beer. Yeah. Not bad. The kind you could drink all night. Sounds like you guys had a good time last night.